Vivo is known as young leading global smartphone brand that officially unveiled the latest Vivo V7+ that available in Senheng & SenQ nationwide. Vivo V7+ is the first selfie shooter with 24MP front-facing camera that has LED flash and FullViewTM Display. This new V7+ ups the selfie game, letting users capture and vividly showcase their memories. Vivo V7+ is launching at Senheng & SenQ between 26th September until 15th October 2017. And you will be the first person to test and try out Vivo V7+. The phone come in two colours (Matte Black & Crown Gold). 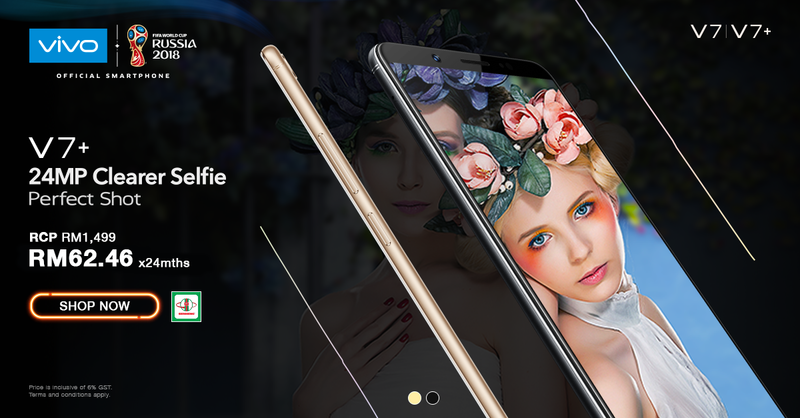 The V7+ reinforces vivo’s leadership in selfies with its powerful 24MP front-facing camera that has LED flash, which produces sharper and crystal-clear selfies. By keeping true-to-life color and contrast as well as clear background at all times, V7+ ensures users’ precious memories remain as vivid and fresh. The V7+ comes with a revolutionary 18:9 FullViewTM Display on a 5.99-inch screen, offering a 12.5% more visual display area compared to the traditional 16:9 screens. User can enjoy the best gaming experience with its 84.4% screen and 2.15mm-thin bezels. The V7+ is also equipped with a Qualcomm octa-core CPU and 4GB RAM, ensuring a smooth and seamless user experience. Vivo V7+ has been upgraded with an AK4376A Hi-Fi audio chip to guarantee you the best music experience. Vivo V7+ is a futuristic phone whereby the youngster is admire about it. When come to purchasing part, I will definitely purchase from Senheng / SenQ (UPS) as I can enjoy more benefits that offer by them. Senheng/ SenQ (UPS) offers up to 24 months installment purchase option. Of course we can choose to purchase at full price with or without installment. The best part, Senheng/SenQ has Extensive Installment option when customer use Maybank, Maybank Amex, Public bank and HSBC. This option applicable to customer that choose full payment option. This is the best part buying from Senheng/ SenQ (UPS) as they offer extra 1 year warranty is you are PlusOne membership. No worries if you not PlusOne Membership as you can join it at RM12. Cool right, you can enjoy extra 1 year warranty on top of Vivo warranty when you pre-order Vivo V7+. While for existing member, you just need to log in senheng.com.my or senq.com.my and place the pre-order for Vivo V7+ in order for you to enjoy the extra 1 year warranty. Cut of the queue by click the option for home delivery. And you will receive your phone in secure condition. For Viv0 V7+, the delivery is open nationwide include Sabah & Sarawak. And the shipping is free. Customer can trade in their old phone and get rebate to knock off the price of new phone. Just present your old phone to the nearest Senheng outlets. More information regarding the trade in program, you may refer to http://www.senheng.com.my/trade-in-rebate .